The nets are originally designed to catch falling gymnasts so don’t be afraid to fall on the nets - you can fall over and over again. Fall on your bum and bounce, or fall over on to your sides. Either way you ca‍‍‍n fall as much as you like without getting hurt. Suspended over 2 storeys in the air - you will not hit bottom! Because you can see through the nets, most people will initially feel a tinge of fear at such heights. But don’t worry, as each layer of nets can hold more than 2 fully laden Singapore commuter buses lying side by side. And just for added safety there‍‍‍ is an extra net at the bottom. Once you start walking you will realise that you are perfectly safe. 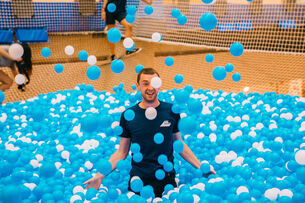 The first unique sensation you will encounter is that of walking on the floaty, bouncy nets…. The best way to describe it: it is a combination of walking on the moon and walking on water. With the soft nets at first you feel yourself sinking - like walking on water but then as you take your next step the elasticity of the nets will push you up. It is a strange mixture of sinking and bouncing with every step! If your legs are still feeling a bit shaky, you can just lie down and take a rest. 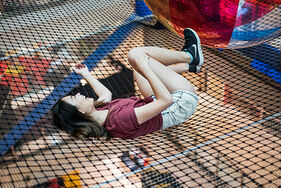 The most awesome feeling you will experience on AIRZONE is simply lying down on the nets. 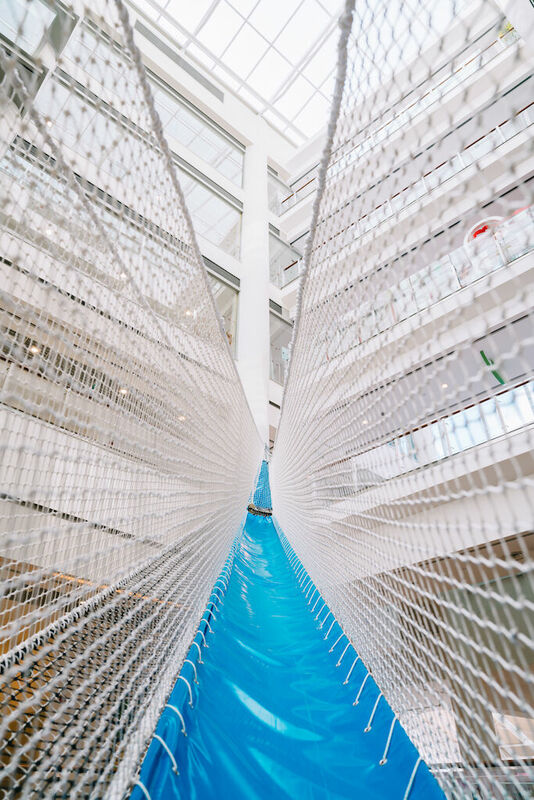 Like a giant hammock suspended up to 5 storeys high, this is a hammock like no other. For those who are more voyeuristic and more inclined to a birds-eye view - you can turn over and gaze down through the nets to below. Check out all the people below! 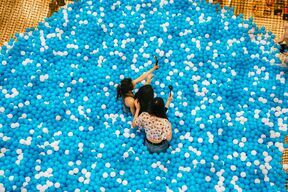 ‍‍‍For kids or the young at heart you can have a ‘splash’ in the floating ball pit - the world’s only suspended ball pit. You could roll around with the balls but be careful, make too big a ‘splash’ and you can spend hours fetching the balls…..But don’t worry they will not go anywhere or fall through the nets. With 2 layers of net, the 3 dimensional net maze will require a lot of crawling to get through….. so we would recommend it as a kids activity. However if you just want to relax you can crawl into your own little maze ‘pod’ and just chill-out. Those who are more active and adventurous will naturally climb all the way to the top level of AIRZONE up to 6 storeys high. In the process of getting there you would have climbed the equivalent of more than 4 flights of stairs. The soft bouncy nets is an abnormal surface so its is not that easy to walk on. Both your thighs and calves will get a good workout. Try running - it’s even harder…. It is almost like doing continuous lunges! It's definitely an excellent way to keep fit while having fun! Who would believe you when you tell people that you are walking 5 stories in the air in the middle of a shopping mall atrium? No one! Although there are over 100 nets playgrounds around the world today, these are exclusively outdoors. 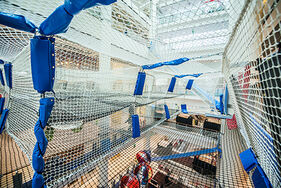 AIRZONE is the world’s first suspended nets playground in a shopping mall a‍‍‍trium. So take that selfie and post it on facebook or instagram or your friends will never believe you! To do so you will require a mobile phone holder - available from the AIRZONE merchandise counter. As a safety precaution the mobile phone holders will ensure that your phone will not fall through the nets. It will also protect those walking below the atrium from the hazard of falling phones. The AIRZONE attraction is an elevated playground with distinct themed zones containing unique games. 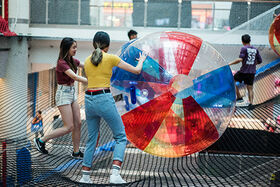 AIRZONE sits in the atrium space of the shopping mall in between the floor levels. Come and explore the fun!